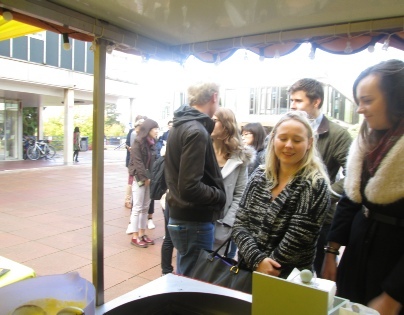 Here is a trade fair catering idea, that can be cooked and served inside or outside, easily set-up on a covered table, a mini marque, our waffle cart or from the waffle van. The waffle chef will prepare the batter or use pre-made waffles to serve the most delicious and sweet fresh waffles with a great range of toppings. This exhibition stand catering is a quick serve item that can be served as an enticing snack or cut in to bite size pieces to hand out as a nibble. The aroma of the sweet batter being cooked with bring great interest to your stand. 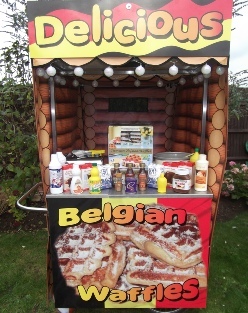 a great exhibition stand catering idea. Hot and Fresh Belgian Liège waffles. Be it a London exhibition centre or an international Expo. We have the experience and the know how that pleases! If this is not enough, then how about crepes? We can make these along side the waffles or as a separate trade show catering experience. The South of England Centre, Business Design Centre, ExCeL, Bournemouth International Centre, Epsom Downs Racecourse, Alexandra Palace, Donington Exhibition Centre, Donington Park, Hilton Brighton Metropole Hotel, Old Billingsgate, G-Mex Centre, Novotel London West, Manchester Central Convention Complex, Queen Elizabeth II Conference Centre, Ricoh Arena, Olympia, Sandown Park Exhibition and Conference Centre, The O2 Arena, Hilton London Heathrow Airport Terminal 5, Lillibrooke Manor, Madejski Conference Centre, The Cardiff International Arena, Telford International Centre, The Royal Armouries Museum, National Exhibition Centre, Stoneleigh Park, Brighton Centre.